The SACNW June general meeting shall be held today, Wednesday June 11th at 7pm at the Lone Star Bar and Grill. If you live in the area please attend and bring a neighbour. 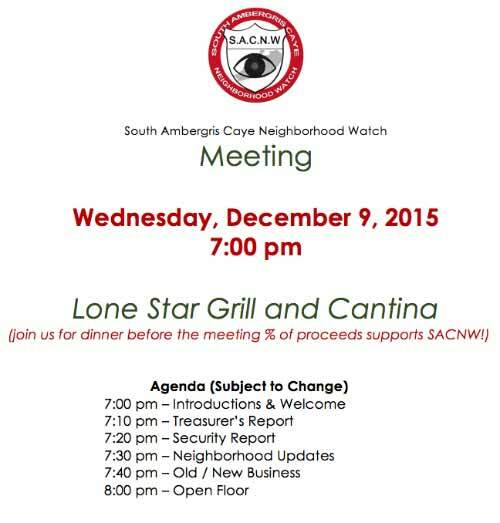 Our July SACNW general meeting will be held on Wednesday, July 9 at Lone Star Grill and Cantina starting at 7pm. We will be accepting nominations for the 2014-15 Executive Committee (EC) positions of President, Vice President, Secretary and Treasurer at this meeting. 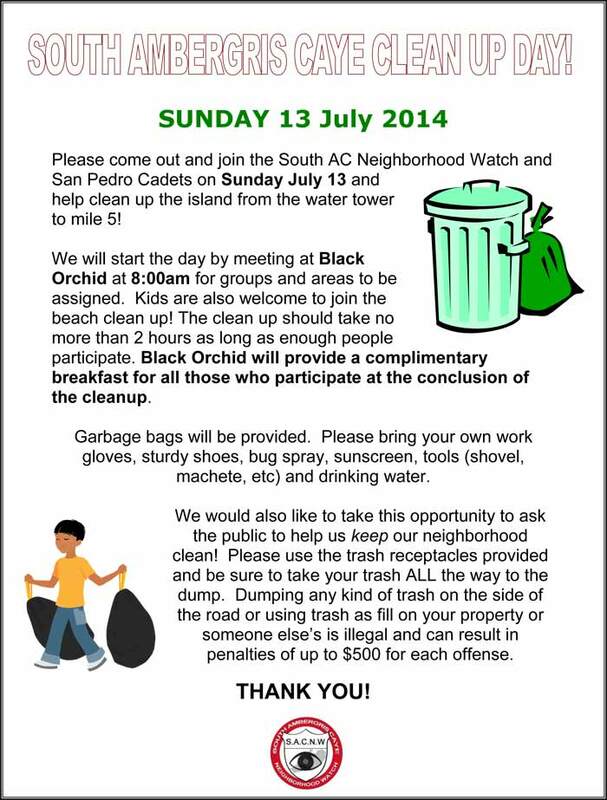 This Sunday, July 13 we will be holding a SACNW Neighborhood Cleanup along with the San Pedro Cadets (student volunteer organization). We will start by gathering in front of Black Orchid Restaurant at 8am where everyone will be assigned to a group. Remember to bring water, bug spray, gloves, and sunscreen. Make sure to wear sturdy shoes. After the cleanup, Black Orchid will provide a complimentary breakfast to all those who participated. Thank you Judyann and Tom! Lone Star Grill and Cantina will be open for regular dinner service. PLEASE ATTEND AND BRING A NEIGHBOR! Our 3rd annual (or is it 4th…but who’s counting) September Potluck Social is on Sunday, September 7 from 11am to 3pm and is being held at the Caribe Island Clubhouse (Pink Condos). If you’re here on the island we hope you will join us for a fun day of mingling with your neighbors and enjoying everyone’s culinary talents. Bob Utsman will be hosting a raffle, so make sure and bring some small bills ($1 or $2) for this event with the proceeds going to SACNW. Beer and wine will be available, but feel free to bring any additional libations. Just a reminder that there will not be a September General Meeting. Please be sure to label your food container with your name so it can be returned to you, and bring a serving spoon if you have one. We have a few that will be available.. If you think you will need it, don’t forget bug spray! A National clean up campaign effort organized by the Scouts Association of Belize is scheduled for Saturday, September 27. The Hol Chan Reserve has been asked to coordinate this clean up for Ambergris Caye. SACNW has been asked to participate in this effort starting at the Water Tower and working South ½ to 1 mile covering beach and roadway areas. Volunteers are asked to assemble at the Water Tower at 8am September 27. You will be given data cards to detail the types of trash collected. Our clean up effort in conjunction with Hol Chan Reserve is this Saturday, September 27. We will meet at the water tower at 8:00AM. Trash bags and latex gloves will be provided; trash pick up data cards will be distributed then. We are asked to “police” the area, road and beach, from the Tower to one mile South. In case of intermittent showers, we shall continue – a downpour….it’s off. 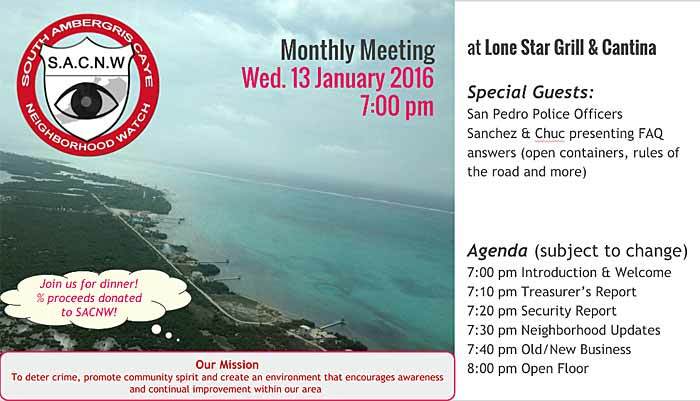 January Meeting: See you there! The South End has a very special opportunity to ask San Pedro Mayor Daniel Guerrero questions. He will be joining our meeting at 7:00 pm, February 10th at Lone Star Grill and Cantina to discuss the new road project. You are welcomed and encouraged to ask the Mayor anything you would like to know, but please, to ensure an orderly meeting, submit your questions in advance. We will not accept questions at the meeting, so please. . . . Thank you so much. See you Wednesday!